Owlia, P., Bameri, Z., Chitsaz, M. (2010). Detection of CTX-M-β Lactamases form Isolated Klebsiella pneumoniae. Iranian Journal of Pathology, 5(3), 137-142. Parviz Owlia; Zakaria Bameri; Mohsen Chitsaz. "Detection of CTX-M-β Lactamases form Isolated Klebsiella pneumoniae". 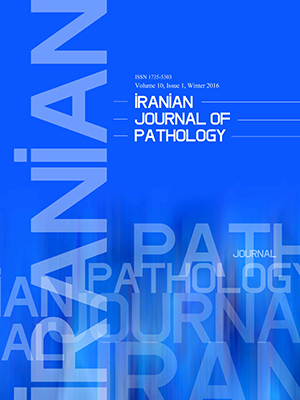 Iranian Journal of Pathology, 5, 3, 2010, 137-142. Owlia, P., Bameri, Z., Chitsaz, M. (2010). 'Detection of CTX-M-β Lactamases form Isolated Klebsiella pneumoniae', Iranian Journal of Pathology, 5(3), pp. 137-142. Owlia, P., Bameri, Z., Chitsaz, M. Detection of CTX-M-β Lactamases form Isolated Klebsiella pneumoniae. Iranian Journal of Pathology, 2010; 5(3): 137-142. Background and Objective: Organisms producing CTX-M β-lactamases are emerging as a source of resistance to oxyiminocefalosporins such as ceftriaxone and ceftazidime. However, the laboratory detection of these strains is not well defined. In this study, phenotypic assay for screening of extended-spectrum β-lactamases producing strains and molecular assay for the identification of CTX-M β-lactamases genes was developed and used to investigate the prevalence of these enzymes among clinical isolates of Klebsiella pneumoniae in three general hospitals of Tehran, Iran. Materials and Methods: Phenotypic detection was used for screening of isolates by agar dilution method. A decrease of ≥3 doubling dilution in an MIC for either ceftriaxone or ceftazidime tested in combination with 4 mg/l clavulanic acid (prepared from Glasco Smith company) versus its MIC when tested alone, confirmed an ESBL-producing organism. The PCR assay consisted of four primer sets. Results: In initial screening test, 117 (69%) from 168 clinical isolates were positive and 51 isolates (31%) were negative. From the positive isolates, 96 isolates were positive in phenotypic confirmatory test. Using molecular assay, 117 strains potentially producing extended-spectrum-β-lactamases were examined for the presence of CTX-M enzymes: 88 strains (75.2%) were positive for blactx-m group І genes, 1 strain (0.85%) was positive for blactx-m group ІІІ genes , and 2 strains (1.7%) were positive for blactx-m group ІV. Conclusion: The prevalence of extended-spectrum β-lactamases (ESBLs) are increasing significantly in hospitals of Tehran. In other side, we found that the CTX-M І group had the most prevalence than other CTX-M groups.